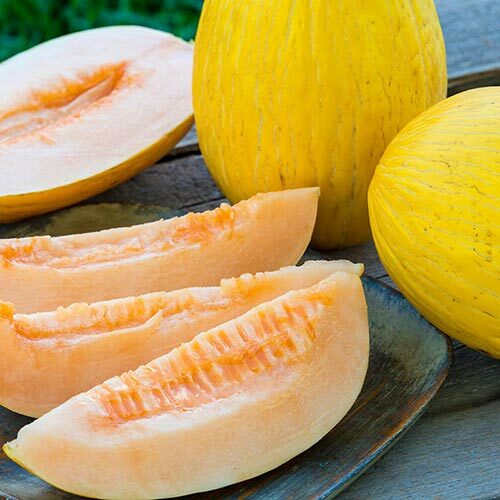 Honey Sak Hybrid Melon's sweetness, texture and color make it a standout. The large, 5-7 lb. melons have a very high sugar content—averaging 14%, a deliciously sweet flavor and light orange flesh. The bright yellow rinds have no netting. Vines show good resistance to powdery mildew and fusarium. Melon seeds can be direct-seeded into the garden after the last frost has passed or started indoors and transplanted to the garden. Melons can be stored in the refrigerator for up to one week. Approx. 20 seeds per pkt. 75 DAYS. Spacing3 - 4 plants per hill 4-6 feet apart or 1 foot apart in rows 5 feet apart. FruitBright yellow rind with no netting and light orange, crunchy, very sweet flesh. Large fruit-5-7 lbs. Seed CountApproximately 20 seeds per packet. CommentsDeliciously sweet, light orange flesh has a pleasant crunch. Has very high sugars, averaging 14%. Bright yellow rind has no netting. Large melons weigh 5-7 lbs.